Casio’s LK-260 makes learning to play the piano entertaining and fun. 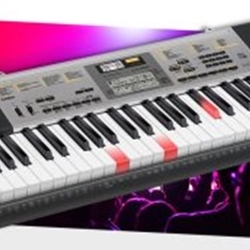 The lighted keys and Casio’s Step up Lesson System provide instruction and assistance allowing you to gain experience and eventually play on your own. The LK-260 is much more than an instructional keyboard. It offers 61 piano-style lighted keys with touch response, a Sound EFX Sampler with a built-in Microphone, 400 Tones, 150 Rhythms, 110 Songs, 5 Voice Pads, 48 Note Polyphony, USB MIDI, Step up Lesson System. The LK-260 has more than enough features to take you beyond the initial learning steps. The new Sound EFX Sampler allows you to record any sound and integrate it into the rhythm. The built-in microphone makes it easy. The LK-260 features an Aux input for connecting your MP3 player or other devices allowing you to enjoy the stereo speaker system in multiple ways. In addition, the LK-260 USB MIDI port is ready for computers and even iOS devices without the need for drivers. Of course there is also a headphone connector for quiet practice. Casio’s combination of the exclusive Step Up Lesson system and lighted piano-style keys make learning to play the piano entertaining and fun. Maybe that’s why Casio sells more lighted key keyboards than anyone else. Casio’s LK-260 offers 48 notes of polyphony so you don't have to worry about dropping notes. Using the sustain pedal for multiple notes, playing big chords, adding rhythms and layering sounds can deplete the polyphony memory quickly resulting in dropped notes. When searching for a keyboard, take the amount of polyphony into consideration. The LK-260 has an impressive library of 110 built-in songs, more than most keyboards in its class. Whether you are using the songs to learn with the Step Up Lesson system, or playing along with a song for fun, you will find greater choices to meet your needs. Compare the number of songs to other manufacturers and you will see Casio has the better value. The LK-260 has lighted keys and Casio's Step up Lesson System to help beginners learn to play piano and discover the world of music. Not only is the LK-260 a powerful keyboard but unlike other companies, Casio includes the AC adapter with all full sized keyboards so you can start making music right away. Casio’s LK-260 includes 150 preset rhythms built into the keyboard. Additional rhythms expand your music composition, creativity and fun. Maxium Sampling: Time 2 Sec. Dimensions: 37 5/16" x 13 3/4" x 4 1/16"